On Tuesday, February 8th at 8 p.m., the Northern club in downtown Olympia is showing a FREE film called O'er the Land. It's a 51-minute documentary film described as "a meditation on the milieu of elevated threat addressing national identity, gun culture, wilderness, consumption, patriotism, and the possibility of personal transcendence." The film made its world premier at the Sundance Film Festival in 2009. While it might not be an uplifting film, it should be fascinating because filmmaker Deborah Strathman has woven in the story of Col. William Rankin who, in 1959, was forced to eject from his F8U fighter jet at 48,000 feet without a pressure suit. Rankin's return to earth is considered an epic journey as he fell through the turbulent center of a massive thunderstorm. 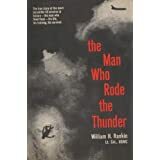 Rankin remained conscious and described his 45-minute harrowing descent through a cumulonimbus cloud in his own book, The Man Who Rode the Thunder. His description of the experience inside this cloud is unforgettable. Click here to read more about O'er the Land, which I will review later this week here. The Northern: An All-Ages Olympia Project is at 321 4th Avenue, Olympia.